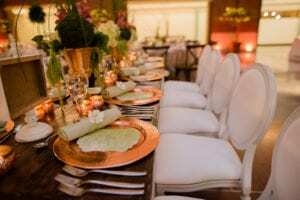 Farmhouse Weddings: Does your vision include elements of a Barn or Rustic Elegance, a Farmhouse Wedding, but your venue’s decor doesn’t fit your design? Check out our one of a kind Wooden Farm House Style Table Topper. Handcrafted by your LUXE Team to fit snug on an 8′ Table Provided by your venue. Add any linen underneath to give it a Rustic Glam Effect to transform your room. Mix with round tables and a complimentary linen to finish off the look. We are very excited to offer our clients the look of the farmhouse table without the cost and it works wonderfully with all ballrooms. Pair this table with our clear chiavari chairs to add even more effect to the design! Schedule a consultation with our stylist to see how this table will work for your vision. 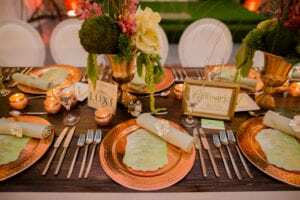 We were asked to supply table designs for the NACE Wedding Trends Presentation and work our designs around the Pantone color of 2017, Greenery. As we know, not many brides are looking to have a room full of Green. So we focused on the details of greenery and how it can be worked in. 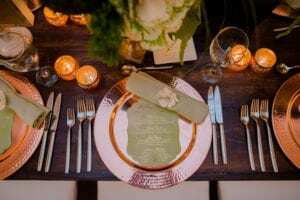 The image below showcases the greenery in the napkins as well as the floral. The key is to keep the look light and airy with a bit of drama.